For a short time I worked a 9 to 5 type schedule, which is a bit unheard of in the cooking world. I would make nutritionally balanced meals every night, and I absolutely loved it! If only I could do it all the time. But with opposite schedules, new jobs, and location changes, we can't always have it that way, right?? One recipe I found during this time was Middle Eastern Chickpea Stew. From the first time I made this, I was in love with it! The funny thing is that when I started making it this time, I was doubting myself. Why would I write about this, it's so simple? And that's the beauty of it! You're just throwing veggies in a pot and it comes out so tasty, you won't even believe how good it is - Promise! To be honest, I cannot remember where this recipe came from. I wish I'd written it down to give the source credit, but nonetheless its here and you MUST try it! I've tried many recipes and they always need a little this or less of that but this one is simply perfect. 1) In a big soup/stew pot, heat your olive oil. Add your onions, garlic and cumin. 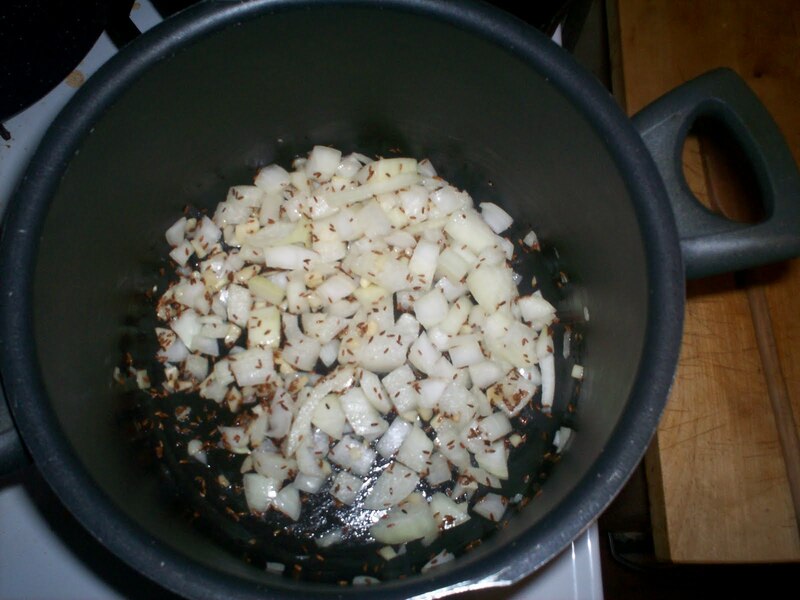 Remember that cumin needs to toast to develop the flavor. Let the onion and garlic saute till softened. 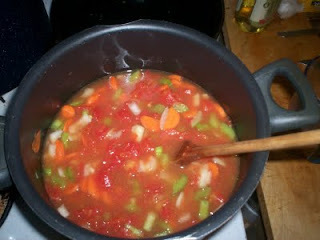 3) Add your veggie stock, then the rice and then the tomatoes. Let it cook for about 30 minutes. 4) Add your chickpeas. You want to cook it long enough so that the rice and the veggies cooked through. *This is why its important to cut your veggies in even pieces. When you've got a big chunk of carrot that isn't cooked and a tiny one that is, its gonna be a bit uneven. I let it cook for about 3-4 hours. The longer it cooks the thicker it will get. 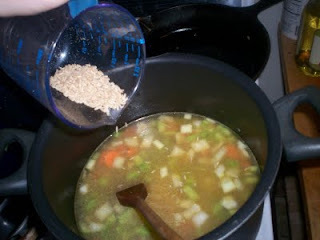 5) Once everything is cooked, taste and add salt and pepper as needed. Turn off the heat and add your fresh parsley. Remember, the flavor will be much more vibrant when you add fresh herbs at the end! Top it off with some grated Parmesan cheese. What I've loved about this recipe is all the different flavors and the way it feels in the mouth. 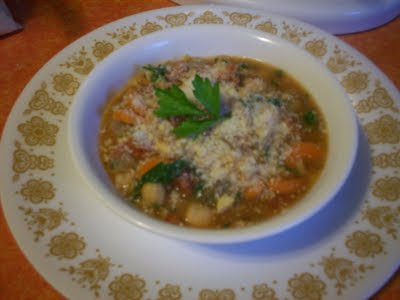 The soft creaminess of the chickpeas, the freshness of the parsley, and the tangy bite of the Parmesan! MMMMmmmm! 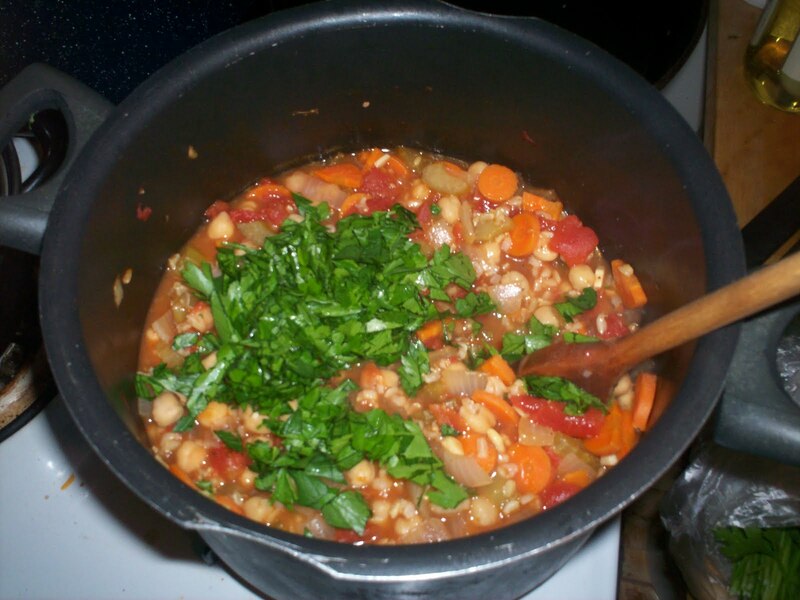 Another thing I love, which is true for all stews, is that it gets cooked all in one pot. Which means that you don't lose any of the nutrients from the veggies. It makes me feel like I'm eating a big bowl of vitamins and minerals. Hey ladies. We're Italian. They're Garbanzo Beans. Looks very yummy.